We have already discussed the Full Wave Bridge Rectifier, which uses four diodes, arranged as a bridge, to convert the input alternating current (AC) in both half cycles to direct current (DC). In the case of centre-tap full wave rectifier, only two diodes are used, and are connected to the opposite ends of a centre-tapped secondary transformer as shown in the figure below. The centre-tap is usually considered as the ground point or the zero voltage reference point. As shown in the figure, an ac input is applied to the primary coils of the transformer. This input makes the secondary ends P1 and P2 become positive and negative alternately. For the positive half of the ac signal, the secondary point D1 is positive, GND point will have zero volt and P2 will be negative. At this instant diode D1 will be forward biased and diode D2 will be reverse biased. As explained in the Theory Behind P-N Junction and Characteristics of P-N Junction Diode, the diode D1 will conduct and D2 will not conduct during during the positive half cycle. Thus the current flow will be in the direction P1-D1-C-A-B-GND. Thus, the positive half cycle appears across the load resistance RLOAD. During the negative half cycle, the secondary ends P1 becomes negative and P2 becomes positive. At this instant, the diode D1 will be negative and D2 will be positive with the zero reference point being the ground, GND. Thus, the diode D2 will be forward biased and D1 will be reverse biased. The diode D2 will conduct and D1 will not conduct during the negative half cycle. The current flow will be in the direction P2-D2-C-A-B-GND. When comparing the current flow in the positive and negative half cycles, we can conclude that the direction of the current flow is the same (through load resistance RLOAD). 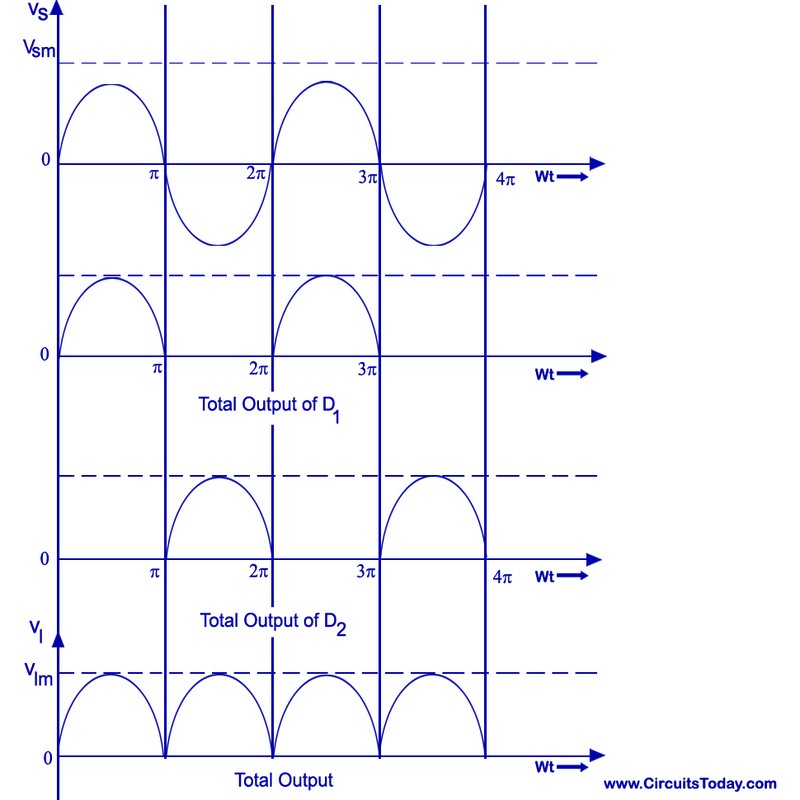 When compared to the Half-Wave Rectifier, both the half cycles are used to produce the corresponding output. The frequency of the rectified output voltage is twice the input frequency. 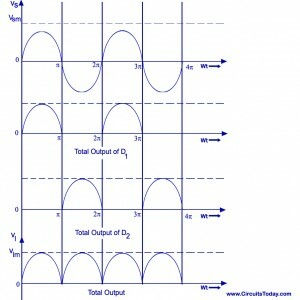 The output that is rectified, consists of a dc component and a lot of ac components of minute amplitudes. PIV is the maximum possible voltage across a diode during its reverse biased period. 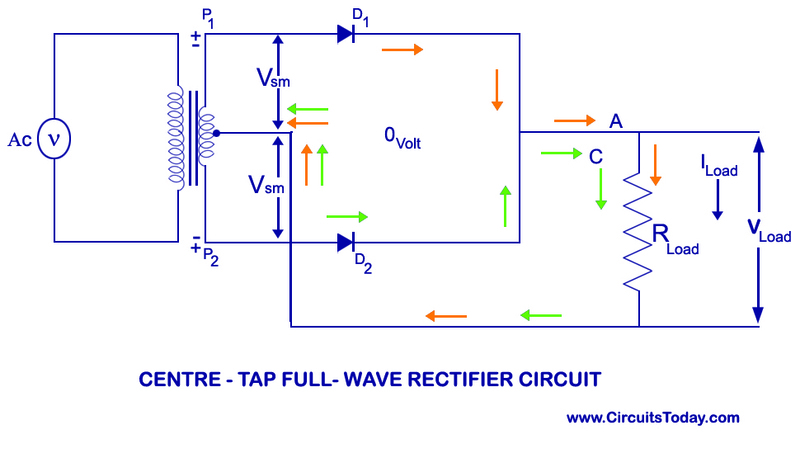 Let us analyze the PIV of the centre-tapped rectifier from the circuit diagram. During the first half or the positive half of th input ac supply, the diode D1 is positive and thus conducts and provided no resistance at all. Thus, the whole of voltage Vs developed in the upper-half of the ac supply is provided to the load resistance RLOAD. Similar is the case of diode D2 for the lower half of the transformer secondary. Since the current is the same through the load resistance RL in the two halves of the ac cycle, magnitude od dc current Idc, which is equal to the average value of ac current, can be obtained by integrating the current i1 between 0 and pi or current i2 between pi and 2pi.